We just love to sit back and relax! An overdose of relaxing can be harmful. Put an end to your excuses and start exercising. There are several studies to show that people who exercise regularly are happier, healthier, more cheerful, more energetic, sleep well, have clearer thoughts and do not suffer from early dementia. • Start on Monday: Starting on the first day of the week makes it easier to stick to the plan. • Never skip for two days in a row: It is okay to skip for a day. But you must exercise the next day, no matter how occupied you are. This rule dramatically increases the number of times you exercise in a month. • Exercise boosts energy levels: Even if you are tired after the day's work, drag yourself for those 30 minutes of energy boosting physical activity. You'll actually be surprised to come out feeling energized. • Spend money on the problem: Spend some extra money to get a personal trainer, to buy an iPod or go to a convenient gym. Exercise pays off really big to your quality of life. You will definitely feel every penny you spent was worth it! • You have enough time:Take a thirty minute walk. If you can't do more, do this! Just a thirty minute walk will really make a difference. You cannot make any excuses on that! • Exercise for good health: The thought of the benefits that exercise provides is motivating enough. It strengthens your immune system, helps in weight loss and has many long term health benefits. It is worth exercising for so many good reasons. 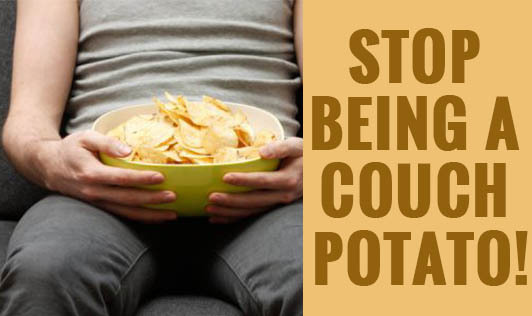 So, stop being a couch potato and start exercising!